Who doesn’t like to eat? Who doesn’t find it difficult to choose food that is not only yummy but also nutritious and healthy? Are you always putting the right kind of food in your body? And what is the “best” diet anyway? Ahhh, food – one of my most favorite topics! First, I love the sensation of eating. Second, I love to cook. Third, I love to eat delicious food that makes me feel good. Having grown up as the daughter of a chef I was taught “nutrition 101” at an early age and have continued to learn about food ever since. Like many of us, I’ve been searching for “the best diet” for years and have tried quite a variety: From Vegan to Paleo, Raw to Mediterranean, DASH to Vegetarian, Bloodtype to American Fast Food, Convenient Food to Nouvel Cuisine, Detox and Juicing to Macrobiotic, Volumetrics to Zone Diet, and back to a balanced, preferably organic, whole food plant based diet. There is not “One Best”. Every human has a different chemical makeup with a slightly different metabolism and mix of food preferences, allergies, and other factors, which means each person has to find their unique “best” diet. Anything taken to the extreme is unhealthy. It’s all about quantity and quality. Example: If we eat chocolate once a week it is probably good for our system (especially dark chocolate of better quality) since it contains flavanols, which are antioxidants and are said to reduce blood pressure and cell damage implicated in heart disease. But eating chocolate every day is not recommended due to its high sugar and fat content. Eat frequently. Eating smaller portions every 3-4h during the day is better for our metabolism than eating 3 meals per day, at least for most of us. Eat at the right time. Not eating anything for 10-12h at night is better for our digestive system, letting it rest as our body recovers from the day. Night time is when the body repairs cells, detoxifies and metabolizes (though people with diabetes and other metabolic health issues might be on a different schedule). In addition, not eating for 10-12h at night helps us keep a healthy weight and might lead to weight loss. Eating breakfast on the other hand is important for our bodies to get the energy needed for optimal functioning during the day. Sleep and digestion are related. Poor sleeping habits will impact our digestion because the nervous system is involved in both of these processes. The nervous system needs adequate rest in order to perform optimally. Eat seasonally. Our bodies are programmed to eat according to the season and our digestion is better if we’re in tune with nature’s rhythm. Go local. Eating food that is grown locally and in season is the way to go. Not because it’s a trend, but because this way we will benefit from the best and freshest quality with the most nutritional value. 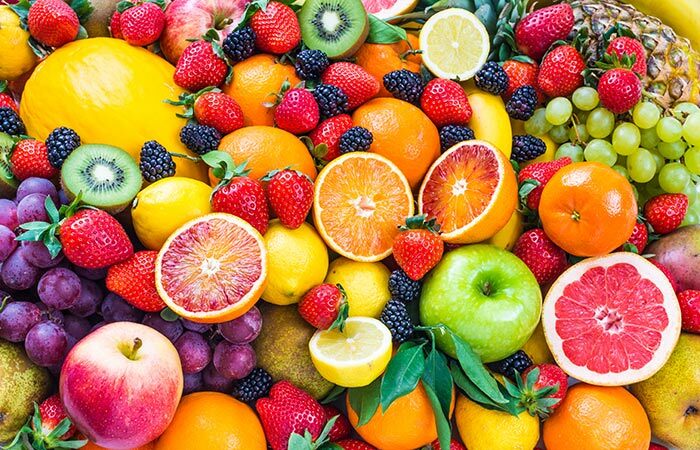 Seasonal food and freshly picked vegetables and fruits have a much higher antioxidant content, plus they are so much more tasty and juicy than produce that has been picked a week ago and shipped from the far corners of the earth. Furthermore, being a locavore is much more eco-friendly and sustainable. Organic is better. Even if some might suggest that the certification “USDA organic” is a hoax because it’s not 100% toxin free, choosing organic foods is still so much more beneficial than eating commercially grown. My argument: At least it is a step into the right direction. The less toxic fertilizers and pesticides we put in our bodies, the better. Increase vitamins and minerals. Even on farms that adhere to the best growing practices, today’s soil is depleted of elements. The result is that our produce has much less nutritional content than it did 50 years ago. What to do? Read on! Juice it up! Add fresh vegetable and fruit juices to your daily meal plan. Juicing squeezes out all the good nutrients from a bowl of veggies into one 8oz glass – super shots of vitamins so to speak! Note: juicing should not be mistaken for smoothies or nutribullet blends. Smoothies blend all of the vegetables or fruits, including the less nutritious fiber, while juicing extracts a concentrated liquid packed with vitamins! Smoothies are great too as it contains the whole veggies and fruits plus the fiber. A diet with poor nutritional value makes us sick. Scientists agree that the “western diet” (lots of meat, milk, fats, sugar, refined carbohydrates, cholesterol, processed foods, convenient and fast food, etc.) is linked to a high incidence of cancer, coronary heart disease, diabetes, and high blood pressure. Plants Rule! More and more studies show that a whole-food plant-based diet low in fat is what keeps us most healthy. A diet rich in fruits, vegetables, whole grains, and legumes has shown to provide all the protein, healthy carbs and micronutrients that our bodies need to stay healthy and prevent life-style diseases. Our bodies benefit from a diet that is more alkaline than acidic. An alkaline diet’s link to reduced instances of disease is a controversial discussion, although research on our “western diet” seems to suggest that this is the case due to its link to higher incidence of diseases. It is known that certain foods like meat, milk, wheat, white flour, coffee, cheese, and white rice are acidic, while others such as vegetables, most fruits, Millet, and Quinoa are alkaline. Watch “Forks Over Knives”, “What The Health”, “Cowspiracy”, “Food Choices”, “Food Matters” and “Fat, Sick and Nearly Dead”! Have you seen any of these movies yet? Please do! They are all a great documentation and explanation of the relationship of nutrition and disease. Most of them are even available on Netflix and Amazon. Read “The China Study”! If you haven’t heard of it I recommend you read it very soon. This article in the NY Times is a great introduction. Wikipedia says: The China Study examines the relationship between the consumption of animal products (including dairy) and chronic illnesses such as coronary heart disease, diabetes, and cancers of the breast, prostate and bowel. The authors conclude that people who eat a whole-food, plant-based/vegan diet, reducing their intake of processed foods and refined carbohydrates, will prevent, reduce, or reverse the development of numerous diseases. Of course the list doesn’t really stop here, but there is only so much one can digest while reading one article. I am looking forward to writing more on the topic of nutrition in the near future. Stay tuned for our nutrition series. And with that I wish you all a happy National Nutrition Month!